Eleven instrumental tracks of some of the best known pieces by Mohamed Abdel Wahab, Om Kholthum, Farid El Atresh and Abdel Halim Hafez. Over 1 hour long. My three favorite tracks are Ooli Amallak Eh, Zay El Hawa, and Ooo Loo Loo. 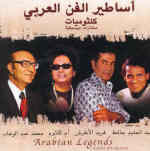 This tribute CD to the great legends of 20th century Arabic music is really a must have for anyone with a serious music collection.